Canberra International Music Festival will present Andrew Schultz’s two act chamber opera, The Children’s Bach, opus 74 (2008) in a concert performance at 7:30pm on Friday, May 10, 2019. In the days after the performance they will also be recording the work for CD release. Genevieve Jacobs is in conversation with Helen Garner and Andrew Schultz at a special breakfast event at the National Library of Australia, on Saturday May 11. The Children’s Bach is an opera by Andrew Schultz in two acts commissioned by ChamberMade Opera with the aid of a Project Fellowship from the Music Board, Australia Council and The RE Ross Trust Playwrights’ Script Development Awards. The work has a libretto by Glenn Perry after the novel of the same name by Helen Garner. The work is set in inner suburban Melbourne in the 1980s and is about 80 minutes duration with a cast of seven including a teenage girl (Poppy) and a ten-year old autistic boy (Billy). The cast is accompanied by an instrumental ensemble of clarinet, violin, cello, double bass, percussion and piano; there is also an on-stage piano that is played by most of the opera’s characters but especially Billy. The work had its first season with ChamberMade Opera in Melbourne in June-July 2008 in a production directed by Chris Kohn and conducted by Brett Kelly and Nicholas Carter. Read more reviews of the work from earlier performances. Full details of the concert and the talk below as posted on the CIMF website. Helen Garner’s novella The Children’s Bach from 1984 has been described as one the most perfect short novels in the English language. By 2008 Andrew Schultz’ operatic transformation had turned the work into a gripping study of human and musical counterpoint. Central to the story is a young autistic boy whose rendition of Bach’s Polonaise for his eldest son Wilhelm Friedemann brings the piece to its cathartic conclusion. This concert is generously supported by Gail Ford. Portrait of Helen Garner by Jenny Sages used with permission of the artist. Genevieve Jacobs in conversation with Helen Garner and Andrew Schultz. Halcyon have released three videos on YouTube of Andrew Schultz discussing his work. In these interviews he discusses his approach to composing and creativity, expressing ideas and communication in music, and the importance and joy of working with words and text. In this series we talk with composers about their craft, their process, their influences, and of course their approach to vocal writing. Built on long working relationships, the conversations have an ease of familiarity but also provide useful insights into each composer’s work, their relationship with Halcyon and the pieces that they have written for the ensemble. a flame of life itself. Yet whilst the text is direct and passionate it also has a classical and simple shape, as if the strength of meaning demands a balancing formality of expression. Like a brand on your body. The music of the piece stems from a few simple sources: a single chord that forms up slowly over a protracted period, sighing glissandi, rapturous moans and calling melodies and a duet refrain that is continuously varied. The work contrasts different possibilities of texture beginning with a solo, then a duet and so on till all six voices are heard. Finally, it closes with a still section – a state of displacement or trance, the literal meanings of the Greek word ekstasis. Wild flower was commissioned by a Song Company subscriber as a gift for his seriously ill partner on a text he selected for performance by The Song Company. The work was composed in September 2006 and draws its text from the Old Testament prophet, Ezekiel. Or wrap you in cloth. No one leaned kindly over you to do anything like that for you. You were as unloved as that on the day you were born. Grow like the grass of the fields. Adapted from Ezekiel 16: 4-7, The Jerusalem Bible by the composer. ABC Classics and the TSO announce the latest in their acclaimed Australian Composer Series. The latest release in the Australian Composer Series features orchestral works by Andrew Schultz: his Symphony No. 3 Century, as well as the works Peace and August Offensive. Century was commissioned for the celebrations surrounding the centenary of Australia’s national capital, Canberra, in March 2013, and premiered in front of an audience of 150,000 people. Chris Wallace of the Canberra Times wrote, “Century is excellent. It is epic. It is powerful and beautiful.” The work speaks to the fascinating history of our purpose built ‘bush capital’, and the struggle between idealism and practicality that was inherent in its construction. It sounds instantly Australian, celebrating the abundance of our natural environment while also warning of its intensity and brutality. Peace was written in 2013 for the Tasmanian Symphony Orchestra, and takes its name from one of JMW Turner’s best-known paintings, Peace – Burial at Sea(1842). This is not a peace of tranquillity, however – rather the uneasy peace that forms after a period of violence and conflict. August Offensive, by contrast, is a very fast, virtuosic and violent work which was premiered at the ANZAC Day dawn service at Gallipoli on 25 April 2013. Commissioned for the centenary of the Gallipoli campaign by the Australian Department of Veterans’ Affairs, it commemorates the horrendous battles in August 1915 which saw some of the most deadly fighting of the entire campaign. Born in Adelaide in 1960, Andrew Schultz grew up in regional New South Wales and Victoria before his family moved to Brisbane, where he completed his secondary schooling. His teachers and mentors included Colin Brumby, George Crumb, David Lumsdaine and Luciano Berio and he studied at the Universities of Queensland, Pennsylvania and King’s College London. Currently Professor of Music at UNSW in Sydney, his music has been performed, recorded and broadcast widely by many leading groups and orchestras. performed by one of the world’s finest small orchestras. JOINTLY COMMISSIONED BY THE AUSTRALIAN WAR MEMORIAL AND THE DEPARTMENT OF VETERANS’ AFFAIRS. Diggers Requiem Brass brings you the spirit of the upcoming Diggers Requiem in a FREE concert not to be missed, commemorating the end of WWI. The Diggers’ Requiem represents – in 12 movements – the battles of Fromelles, Pozières, Bapaume, Bullecourt, Villers-Bretonneux, Hamel, Amiens, Péronne and Mont Saint-Quentin, Bellenglise, Montbrehain, Ypres and Passchendaele in Belgium. It refers to death of the Red Baron and the charge of Beersheba in Palestine, which was the last great charge of cavalry. 62,000 bells representing each Australian who died are incorporated into the last movement, Lux Aeterna. The different movements were written by some of the greatest Australian contemporary composers, as well as the recently discovered Frederick Septimus Kelly, who died at Beaumon-Hamel in 1916. His Lament of the Somme, which evokes the Battle of Pozières, near Albert, was written just two weeks before his death. Elena Kats-Chernin, who finished writing her piece last year, will evoke the battle of Bullecourt in the Pas-de-Calais. Alex Lithgow who wrote the stirring Victoria March, which was played by the Australian Army as it marched into Bapaume in 1917, has his work incorporated into Nigel Westlake’s the Glass Soldier, a piece for trumpet and orchestra. A lone piper plays a lament by Pipe-Major John Grant in the last movement..
Paul Goodchild trumpet (AUS), David Novak accordion (Slovenia), Simone Riksman soprano (Holland), Christina Wilson mezzo (AUS), Andrew Goodwintenor (AUS), David Hidden baritone, Jason Craig bagpipes (AUS). Directed by Christopher Latham. Andrew Schultz’s Ghosts of Reason – Symphony No 2, op 76 (2008) has just been pre-released on a compact disc and in digital on-line format. The Naxos-distributed Navona CD is called Reason and Reverence and is performed by the Czech orchestra, the Moravian Philharmonic, conducted by Petr Vronsky. More details of the recording at this link. “The symphony starts with the delicate sounds of a harp like the gentle swaying of grass in the breeze. The breeze intensifies and so do the tones of the harp to a degree that is almost surprising. The brass instruments have joined in although only the harp seems to be noticed. More and more instruments join in and divinely beautiful harmonies fill the room. There is somehow something unknown about it. The violins are not playing the melody. It is the usually accompanying instruments changing roles and taking over the lead. The tempo increases, but suddenly a strange kind of calm descends over the audience. How can it be that the violins continue playing? And yet, all light tones seem to have suddenly disappeared. The double bass has taken control of the orchestra! “I would like to be able to convey the scorched, rich ochre sonority found in the voices of Aborigines”, says Andrew Schultz about his work. He has definitely succeeded in doing so. We, the audience, are spell-bound by this music that takes us on a tour through the desert with whispering wind, through rich and fertile areas with birds flapping their wings, to the coast and the roar of the ocean. More about the work at this link. Reason and Reverance represents an aural exploration of our world’s complexities. By comparing and contrasting present triumphs with past regrets, the composers on this album develop a compelling, philosophical reflection of the world we live in. Conducted by Petr Vronský, the Moravian Philharmonic Orchestra delivers a master class in cohesiveness while tackling a wildly diverse, yet wholly complete set of compositions. The album starts strong with Christopher Keyes’ An Inescapable Entanglement. 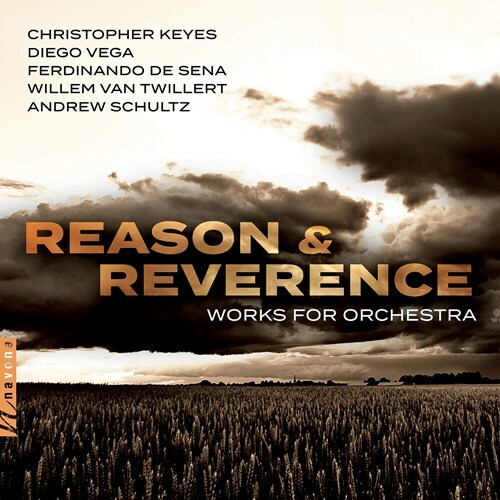 Keyes binds minimalist elements with late 16th and early 17th century forms of concerto to create a controlled chaos of instruments and voices playing distinct parts simultaneously. In his intent to create an antiphonal sound, Keyes employs eight loudspeakers to project the music achieving a thickened, full texture. Red Rock is a symphonic poem commissioned by the Henderson Symphony and its music director, Taras Krysa. The music is based on the interaction of two musical materials, the first, calm and diatonic, presented by the French horns after the introduction and elaborated by the trumpets and the woodwinds; and the second, more angular and chromatic, also introduced by a solo French horn in the second section. Similar to a sonata form, these materials go through transformations and developments in the middle section, and return evolved and reconciled at the end of the movement. The piece suggests a gliding trip over the stunning landscape of the Red Rock canyon, with its sharp geological contrasts, its ever changing shapes, and its surprising colors. Fernidnando De Sena’s Deciphered Reverence explores the idea of divine presence and creates an interpretation through the consistent, triumphant swelling of the orchestra. De Sena’s piece captures the many moods, modes, and colors in the music to translate his vision of life and celebrate its ambiguity and omnipresence. Composed by Willem Van Twillert, multiple styles set the foundation for Branches of Singularity. Multiple developments transitions from one style to another create an enticing and evolving piece. Andrew Schultz’ Symphony No. 2 – Ghosts of Reason ties the whole album together. Slowing the pace of the otherwise energetic album, Schultz’s composition paints a haunting atmosphere by drawing out the wistful bleakness of its wandering melodies. Andrew’s music has featured in many Halcyon programs over the years and we have great memories of developing I am writing in this book at the Musician’s Cottage during a Bundanon residency with him in 2011 as he got to know our us and our voices even better in that beautiful natural surrounding amidst the wombats, birds and occasional cattle. Purchase the CD by direct deposit from Tall Poppies before the 1 May and you’ll pay only $23 for the CD (postage included). Just send your name, postal address and banking receipt to tpoffice@iinet.net.au. Sedition has released a digital version of the Perihelion recording of Andrew Schultz’s Barren Grounds, opus 36 (1988) and it is now available on all digital music store websites including iTunes and online streaming networks including Spotify. The performers who were in Perihelion for this recording were Nigel Sabin, clarinet; Patricia Pollett, viola; Gwyn Roberts, cello; and Colin Spiers, piano. Cover art is by Nicole Saintilan. Catalogue number is Sedition9. South of Sydney, on the Illawarra escarpment overlooking the sea, Barren Grounds is a wilderness reserve and bird breeding area. With a strange and otherworldly landscape – stunted growth and marshy ground – the place feels still, yet the strange, eerie surface conceals a fecund underlife. For me, the place occupies a state of mind; this, rather than any programmatic intention, prompted the title. Movement 1, is a slow, lyrical and sinewy reworking of a vocal piece, Seafarer, whose final line: “And learn to sleep upon this ground”, with its reference to mortality, suggested the passacaglia form used. Paul Klee’s ornithological automaton painting, The Twittering Machine, gives Movement 2 its inspiration. The musical intention at times resembles an ungainly machine that keeps running awry and needs to be wound-up again. Spinning out rhythmic fragments and employing mosaic technique are recurrent preoccupations. Barren Grounds is scored for for clarinet, viola, ‘cello and piano and was the inaugural work commissioned by Perihelion (an ensemble resident at the University of Queensland). Itwas composed with financial assistance from the Performing Arts Board of the Australia Council. www.andrewschultz.net has just had a complete redesign and now has many more functions, useful links and a greatly enlarged content so please check it out. The new website was designed by Marco Gatta at Technique Interactive. So this blog won’t be updated any further and at some point it will go to the great digital graveyard in the cloud. PS … And whilst you’re still here, there is a final piece of news: Sydney clarinettist extraordinaire, Jason Noble, has released a new CD of clarinet music including Night Birds for solo clarinet by Andrew Schultz. The CD is called Chi’s Cakewalk and is available online from iTunes etc and from music stores as a CD; here is a link with more information, details and excerpts. PPS … Will there be, I hear you ask (well, virtually hear you ask), any record left of anything from this era in history if it’s all destined to be digital ephemera???? Thank goodness we still have landfill for future archaeologists to dig around in. Is water safer than land? We swallow salt, we swallow blood. A deep grey sky, and pre-dawn calm. The wind calls. A child’s voice. Southern Cantata, a new advent cantata commissioned by St Johns Southgate, Melbourne to celebrate their Bach Cantata Program’s 20th birthday will have its premiere on Sunday 3 December 2017, at 9am. The work is scored for for choir, 2 soloists and period instrument orchestra (strings, trumpet, timpani, theorbo, harpsichord and organ) composed by Andrew Schultz to a libretto by Katherine Firth. Kate Macfarlane (soprano), Robert Macfarlane (tenor). The Cantata performance will be preceded at 8:30am by a discussion of the new work with Katherine, Graham and Andrew.